Despite the fact that I probably have more than a lifetime supply of pink lippies, occasionally I still find myself without one on the go. I usually buy something from a discount store nearby my downtown work place if this happens. L'Oreal Colour Riche Le Gloss Berry Chic was the latest "emergency pick-up" that was supposed to be a one day thing, but I ended up really liking it. I had tried a few when the Le Gloss range first came out but found they were not really my thing. The colors seem all quite sheer and they feel maybe too slippery. I am not big on tube lip glosses anyway. They are very hydrating on lips without being tacky and ideal for layering to add shine and moisture, if that's what you look for from lip gloss. However, this particular shade, Berry Chic is very pigmented and even staining, which is a pleasant surprise! 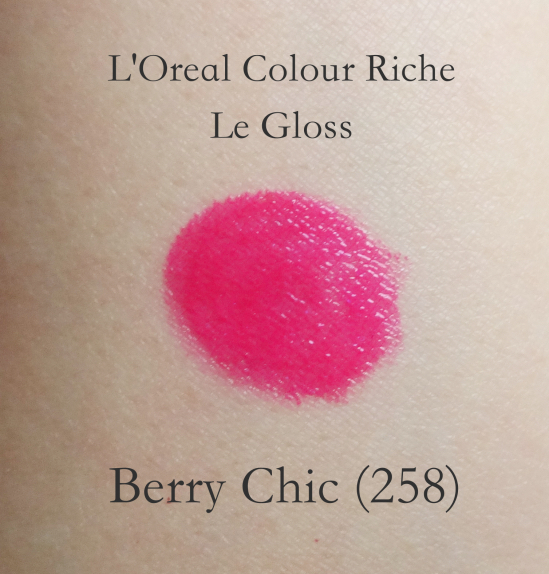 Berry Chic differs dramatically from the other Le Gloss shades I've tried that it makes me wonder if it is the kind of pigment used. Maybe hot pink/magenta is more staining than others? These three lip products are all quite long lasting and leave strong stains behind. Other colors I've experienced from the same ranges act differently, so there is my little hypothesis. Sorry about those orange-y rims. I remember I was wearing that drying Rimmel matte lipstick then applied Le Gloss Berry Chic later on to ease the pain. Here is an overall look. Besides the fact this lip gloss is probably quite old since it is an LE shade from many seasons ago, I am immensely enjoying this hot berry pink lip gloss. Hence this humdrum blog post, because we are supposed to blog about something we love, right? It just effortlessly brightens up my complexion providing comfort and a long lasting color on the lips. Plus it was like $2. I am not complaining that L'Oreal Colour Riche Le Gloss Berry Chic is distinguished from other Le Gloss shades, but why do you suppose a certain color performs differently from other colors even though they are from the same range? Any thoughts? I think it probably does have to do with the pigmentation sometimes - if certain pigments show up better than others or are closer to the desired shade, they don't have to dilute/tweak it so much, which probably improves the formula...but that's just my theory. I think this is gorgeous! 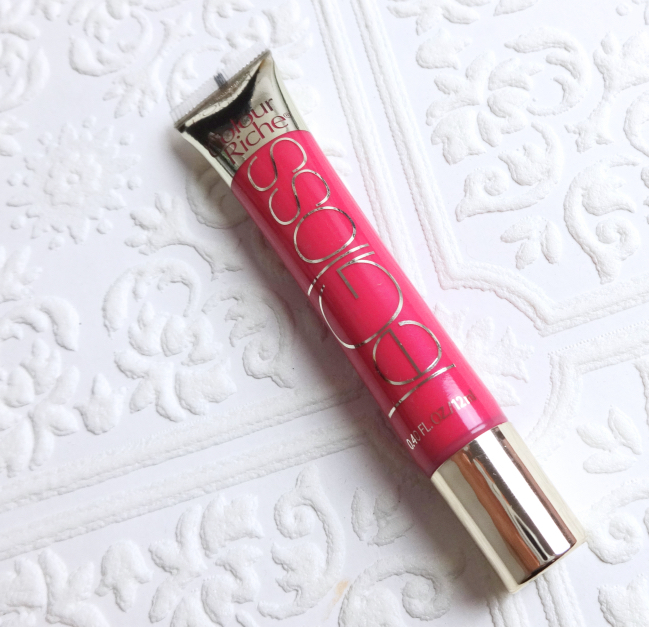 I agree that tube glosses are a bit messy to apply, and I don't always find them more hydrating, but this one does sound lovely, and it's such a steal! Hot pink lips are definitely your thing! It's just one of those colors that always looks great on you. I tried one of these puppies a few years ago and liked it, but for some reason, one was enough. I remember loving the creme brûlée scent! It is super weird when one shade seems different from the rest of the entire line. So pretty on you! I wish this one was still around! Thank you very much, Jen! Revlon Pink Ruby is super bright and saturated color! I can only wear it as a stain after blotting it out. Revlon and L'Oreal make great products in general, but I still think they are not worthy of highly marked up price. You guys have easier access to all the Asian road shop/ drugstore brands, though! wow the shade is so pretty! It looks very bright and bold though which is rather unusual for tube lip gloss and $2 is a steal!! What a great $2 find, this shade works so nicely with your skin tone. I too find different shades within same range work differently, my guess is the pigments too. It's too bad as sometimes I purposely buy another product from the same range after falling in love with something, and end up utterly disappointed. The lip gloss was sealed and I don't have any issue with it, but technically I shouldn't be using old lippies like this (then that means I have to get rid of many from my lip stash so I choose not to dwell on it too much ;p). I think I only have a handful of lip gloss in my stash. 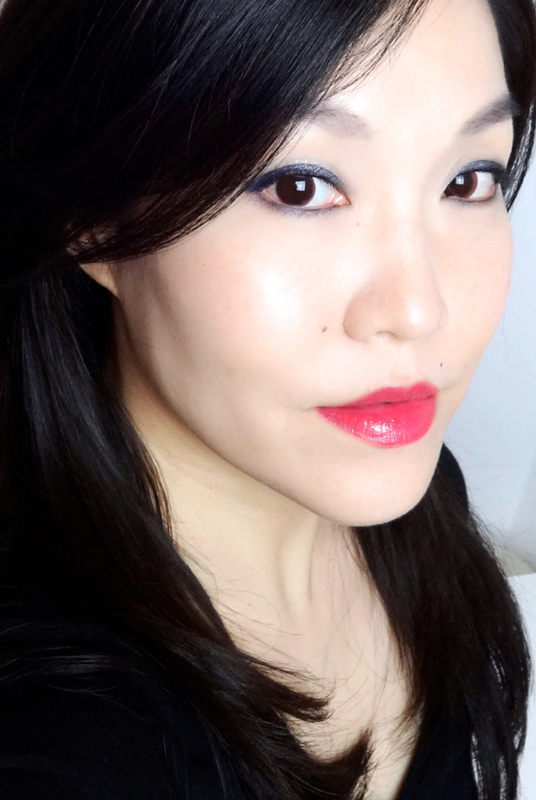 The brightest pink I have is Rouge Dior Brillant in Soho - most pigmented too. I guess because I don't wear glosses much, I don't pay attention to them. However, I love to see others wear it, especially you because you wear them so well! This is much prettier and more pigmented than I thought it was! I love it when you go down to that drugstore, LOL!